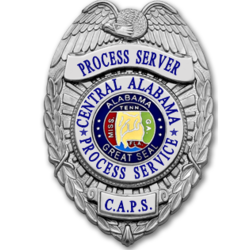 Thank you for interest in Central Alabama Process Service (C.A.P.S.). We are a privately owned process service based in Millbrook, Alabama. In today’s complex legal environment when time is of the essence, process service by sheriff’s deputy or certified mail is no longer practical or cost effective. Serving court documents is a secondary responsibility for law enforcement officers, and as a result, takes a back seat to their other responsibilities, and trying to perfect service by certified mail can take weeks. In most cases, C.A.P.S. can serve your documents the same day*. Our straightforward approach to process service and our limited service area enables us to promptly and efficiently get your documents served. When you call C.A.P.S., we will make arrangements to get your documents, either in person, by mail or by email. Once we receive your documents, obtain any other pertinent information and receive payment in full, one of our plainly clothed, causally dressed process servers will promptly serve your documents. When service is perfected, we will return the completed paperwork to the address you specify. At your request, we can send the return on service via email, as soon as service is perfected. We take the worry, hassle, and waiting out of having papers served. At C.A.P.S. we feel that simplicity is the key to effective process service. That’s why we don’t “dilute” our business by chasing people, doing investigations, skip traces or offering other services that ultimately don’t have anything to do with document service. We understand that your time is valuable, so we focus our skills and resources solely on getting your documents served in an professional, efficient and timely manner.